Yes, depending on what you want from a bike. If you want a bike that you can lift with one finger and can climb a rough terrain mountain then, no. If you want a solid, simple bike to do road and light trails on then yes. It is not a commuter bike per se but would be ideal for a shortish ride down a road/tow path or disused railway to work. It will do very well on roads if you keep the tyres fully pumped up. These hybrid bikes are very unforgiving for anything more than that though. Rougher ground and you will your arms ache after a few miles. This is a good bike to see if cycling is for you. 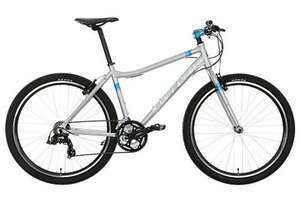 It will do for a simple commute as well as a leisure ride both on road and on trails. Once you get fitter you might move on from this but for most occasional or short distance users then this would be great. As above, you won't win the TDF on it but it'll be 10 times as good as the £79 crap from Tesco/asda/etc. says they will not fit on a mtb rim despite the 26" description, first tires you linked are good though might get some, cheers. says they will not fit on a mtb rim despite the 26" description, first … says they will not fit on a mtb rim despite the 26" description, first tires you linked are good though might get some, cheers. Remember the ladies bike in the original post is a 27.5 rim though. Sadly it's almost too easy to make up an innuendo from that sentence, that I didn't even try. Shows as £199 for me with £20 off £200 so presumably you need to add something for £1 to get the £20 discount making it £180 or have I missed something? As above, you won't win the TDF on it but it'll be 10 times as good as … As above, you won't win the TDF on it but it'll be 10 times as good as the £79 crap from Tesco/asda/etc. I got this hotukdeals.com/dea…450 from Tesco 3 months ago and flew past a few Carerra road bikes on our local charity bike ride at the weekend! I got this … I got this http://www.hotukdeals.com/deals/vertigo-carnaby-700c-unisex-road-bike-65-tesco-direct-2149450 from Tesco 3 months ago and flew past a few Carerra road bikes on our local charity bike ride at the weekend! I wonder when halfords have those weekends when prices are reduced? Halfards have a steel frame ladies bike listed at 14kg's, so something isn't quite right. My Daughter has this and she loves it. We have a few Carerra bikes and they have lasted an age! they are so much better than the carp you see on special outside sports direct ect. Yes you can find cheaper bikes but they won't be as good value. Lol no uphill into a headwind! My Daughter has this and she loves it. We have a few Carerra bikes and … My Daughter has this and she loves it. We have a few Carerra bikes and they have lasted an age! they are so much better than the carp you see on special outside sports direct ect. Yes you can find cheaper bikes but they won't be as good value. I imagine the carp aren't happy about it either..
How much can you afford? You could buy something like the B'Twin Triban 500SE for £330 from Decathlon which is pretty good for the price and a decent starter bike, but you generally get what you pay for and most of the Btwins or Carrera race bikes are decent enough for a beginner. well I don't mind spending a little extra but I'm very picky meaning I've seen some great alloys sets but don't know if they would fit or would I need to change something or buy a special type of rims? I don't actually know whats a good brand to go for?! By the way it has to be light weight ! No suspension , our road is cobbled ...... You would hear our lass "coming" from a mile away ! The bolt for the derailleur probably needs a bit of threadlock, nothing major.